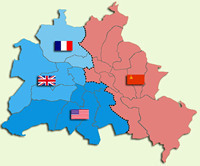 of East and West Berlin after the Fall of the Berlin Wall. "Hearing of the events in Berlin I flew in to the city from my base in London. I'd grown up in the shadow of the Cold War and to be a witness to this momentous piece of history was thrilling." Don't panic - these photos were shot in black and white to add to the atmosphere of the occasion. "We welcome change and openness; for we believe that freedom and security go together, that the advance of human liberty can only strengthen the cause of world peace. "There is one sign the Soviets can make that would be unmistakable, that would advance dramatically the cause of freedom and peace. "General Secretary Gorbachev, if you seek peace, if you seek prosperity for the Soviet Union and eastern Europe, if you seek liberalisation, come here to this gate. "Mr Gorbachev, open this gate. Mr Gorbachev, tear down this wall!"